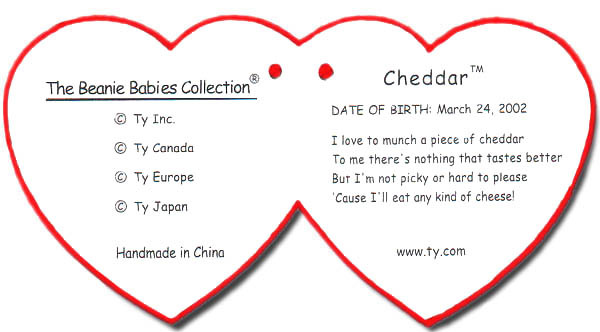 Click on any tag image for a larger view! 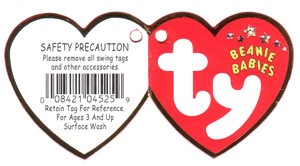 NOTE:Images below with a drawn red outline represent the inside of a hang tag. 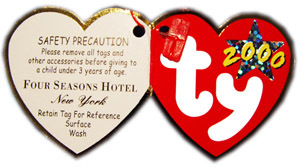 These 6th generation heart tags were introduced during March of 2000. 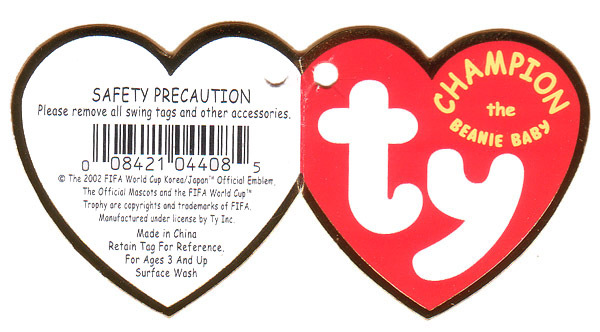 The biggest change on this tag is that the previously existing yellow star on the front has been replaced with a holographic star with "2000" written across it in a yellow font. The inside left lists the four Ty distribution areas: Ty Inc., Ty Canada, Ty Europe and Ty Japan. 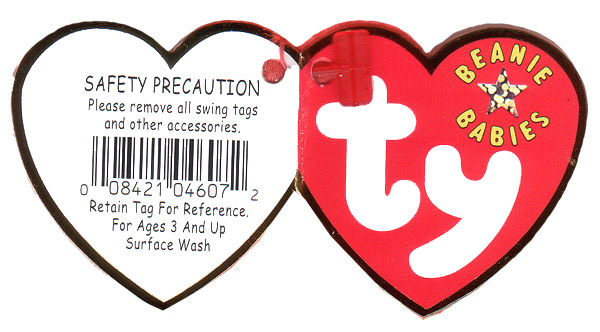 On the European versions of the "2000" hang tag it says "Ty Europe Gosport, PO13 OFW" instead of just "Ty Europe." 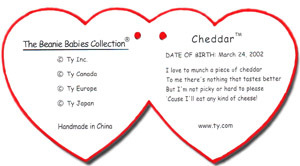 The Beanies name, birthday and poem are now in a smaller font, the back of the tag has a new safety warning, a smaller bar code and a smaller font. These 6th generation heart tags are found on Beanies with ONLY 9th generation tush tags. 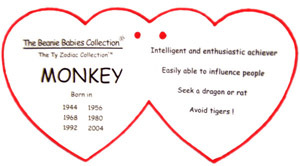 The Zodiac Series Tags are also considered 6th Generation. The 2000 Holiday Teddy Tag is also considered 6th Generation. 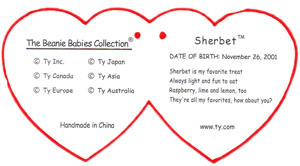 Also Periwinkle and Sunny's special e-Beanie tags are 6th Generation. 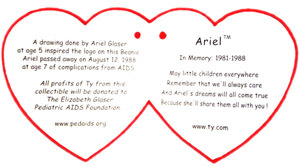 Another Special 6th Generation tag is on Ariel. 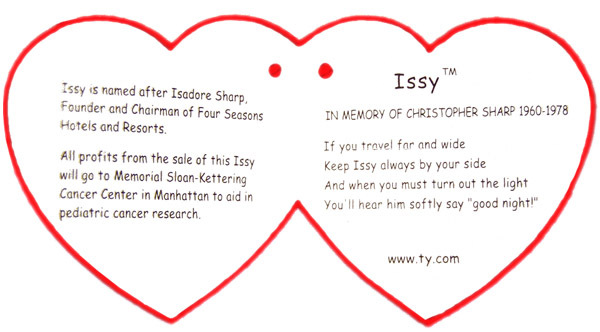 Only the Issy from the New York Four Seasons Hotel has a 6th generation hang tag, all others have 8th or 9th generation tags. 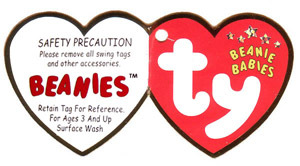 There are 64 Beanie Babies that can have 6th generation Swing tags! 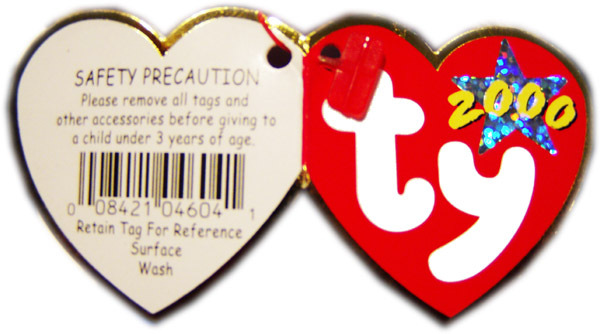 These 7th generation heart tags were only released in the UK (European), the tags are just like the 6th generation tags however, the hang tag says 'Ty Europe Gosport, PO13 OFW' instead of just 'Ty Europe'. The only other difference is that "BEANIES" is written across the yellow star. 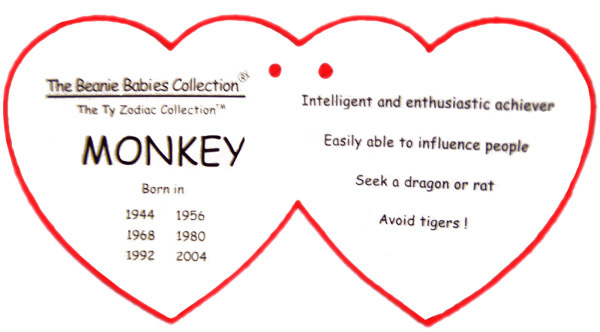 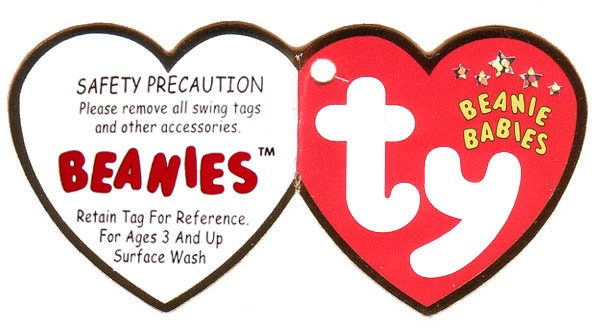 There are 108 Beanie Babies that can have 7th generation Swing tags! 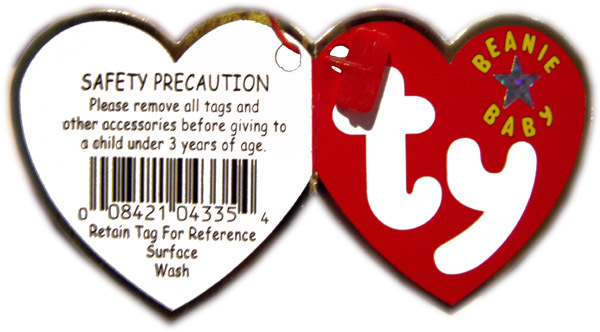 These 8th generation heart tags were introduced in the beginning of 2001. 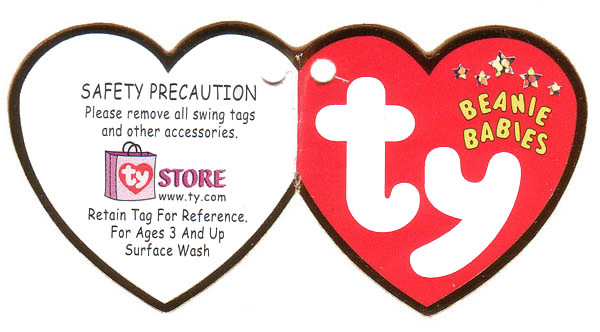 The front of the hang tag has a new look. 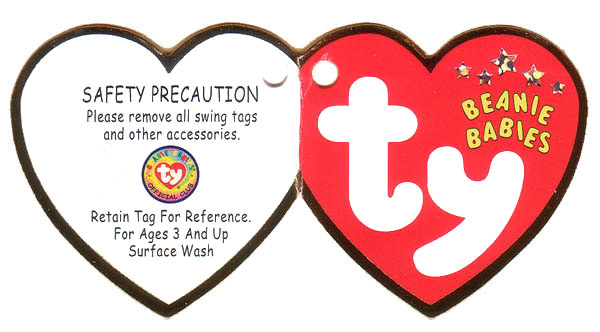 In the top right hand corner it now has "BEANIE BABY" printed in a circular position, around a small holographic star. The rest of the tag appears much like the 6th generation tags. 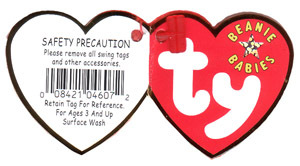 These tags are seen on Beanies with 10th generation tush tags. 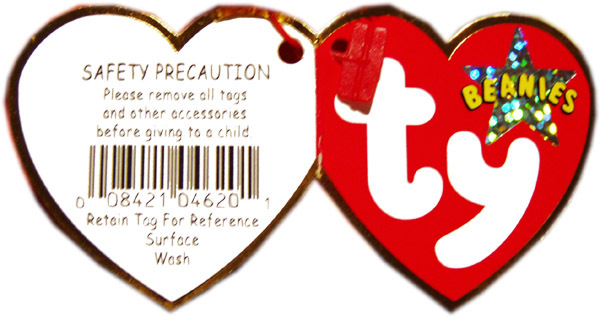 In July 2001 these new tags started to appear on Tradee and then later the rest of the new releases! These tags look exactly like the 8th generation tags with one exception, around the star it now says "BEANIE BABIES" not just "BEANIE BABY". 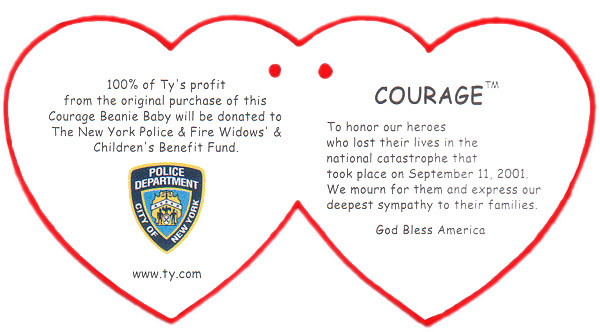 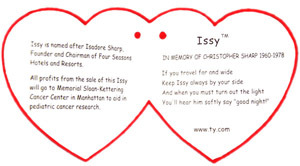 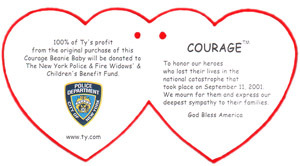 Included in the 9th generation hang tags are Rescue & Courage, two Beanie Babies sold in the TyStore online to raise funds for the September 11, 2001 Terrorist Attacks on the World Trade Center, and also America the Beanie Baby. There are 35 Beanie Babies that can have 9th generation Swing tags! 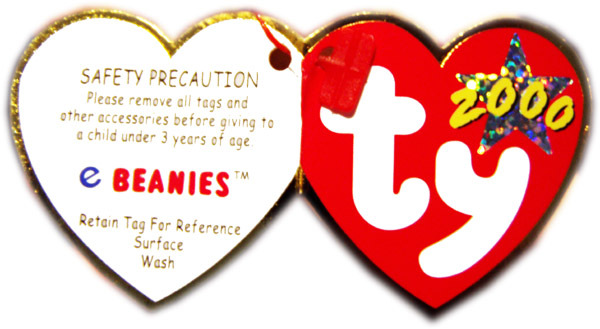 The 10th Generation Hang tag was introduced December 27, 2001 with the announcement of the new 2002 January Beanies. These tags are seen on Beanies with 11th generation tush tags! 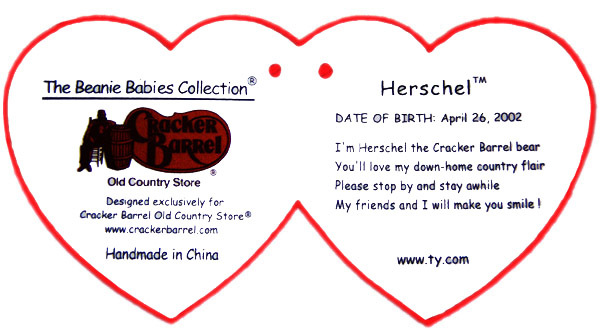 11th Generation tush tag can have the date 2001 or 2002 on them. 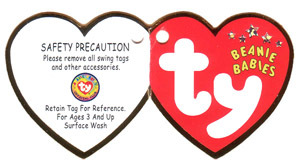 Return to Main Tags Page!